Occasionally, my mom would make peanut butter balls (fresh ground peanut butter, sunflower seeds, honey) or we could eat small bites of our carob Easter bunnies–which we made last a long time. 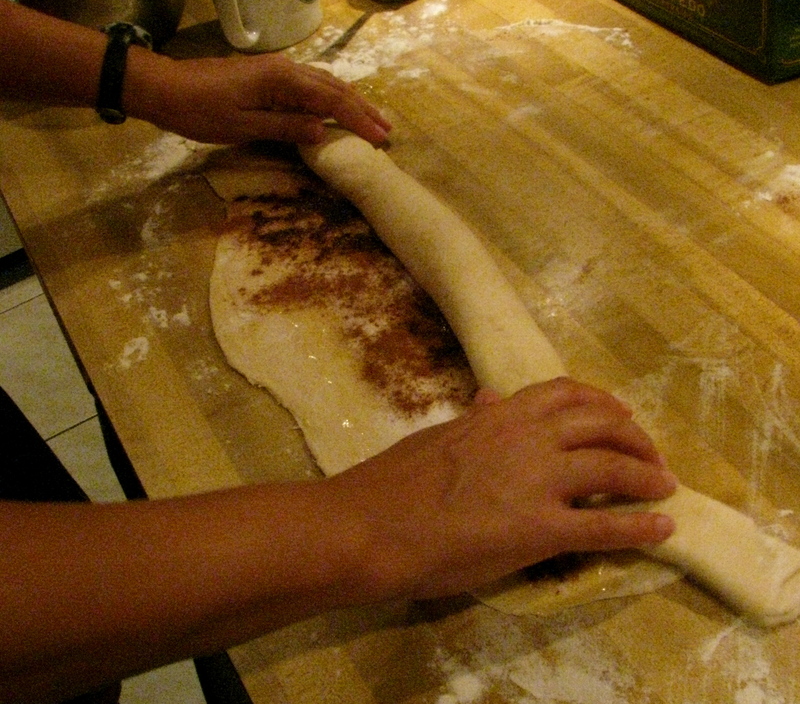 Less rarely, my mom would end up with leftover bread dough—and decide to make cinnamon rolls with it. 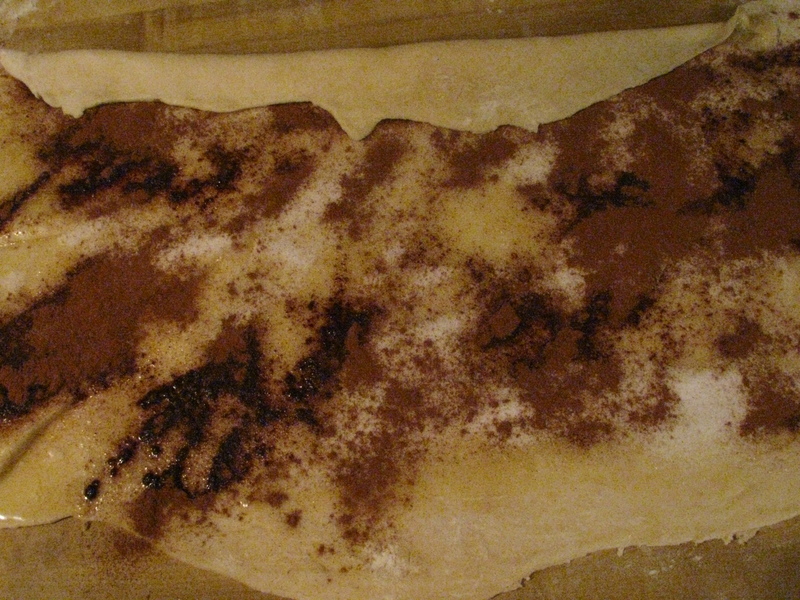 She flatten the dough, add some butter, honey, cinnamon and raisens, roll it up, and bake it up nice. 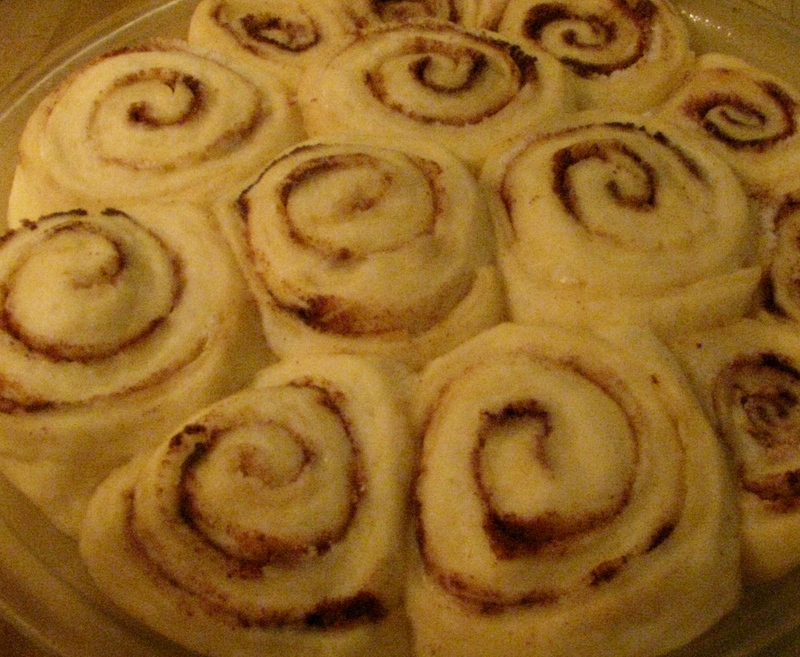 These whole grain, not so sweet, dense and dry cinnamon rolls were heaven to us. We LOVED them. This all changed as we grew up and realized that what we considered cinnamon rolls were quite different from those out in the ‘real world’. In the ‘real world’ cinnamon rolls came from the mall for $3 a pop, were covered with white gooey frosting, and gave you a horrible stomach ache after eating one alone. 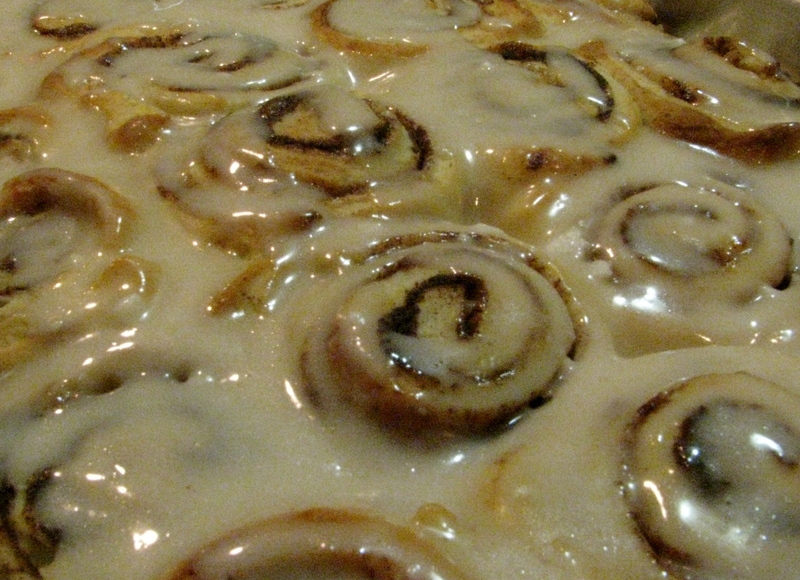 ‘Real World Cinnamon Rolls’ could not be made at home. They required industrial supply sugar and some special kind of magic that my mom just did not have. And, I am going to tell you how—-I will impart some of my cinnamon roll making magic on you–for free! Today must be your lucky day. First, I should admit, that I went to the all-mighty Pioneer Woman for cinnamon roll advice. I also conferred with Baking Illustrated and our old family recipe. The Pioneer Woman won (again) because of her very nice photos and step by step directions. I did modify her recipe slightly, to both reduce the butter content (slightly) and make less rolls. So, if you feel like doing something good today–make these. 1. 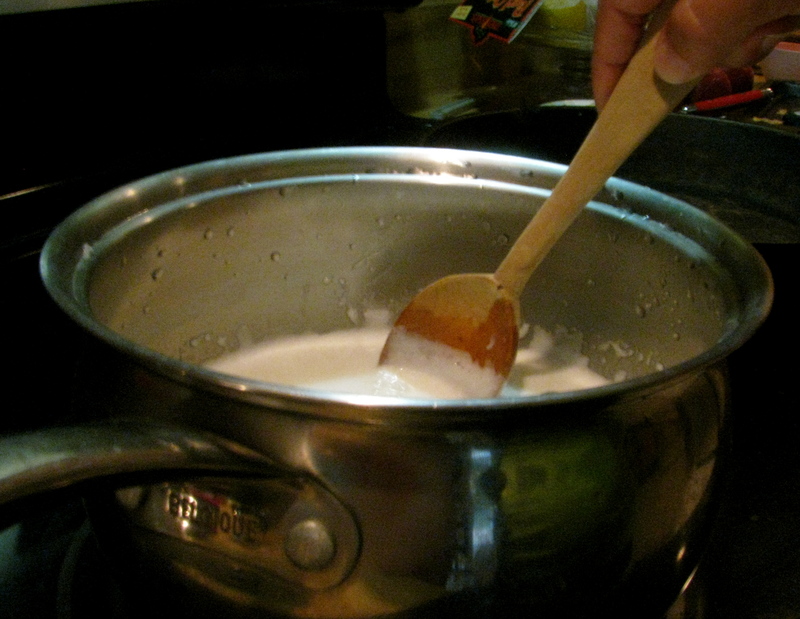 Mix two cups of milk, 1/2 cup vegetable oil, and 1/2 cup sugar in a pan on the stovetop. Make sure your pan is big enough to add a bunch of stuff to it. Heat the mixture until it is scalding—-not yet a boil, but close. Let it sit for an hour. 2. An hour later: Check your mixture and add 2 1/4 tsp. of yeast. Throw it on top and swish it around a little bit–let it sit for about a minute. Add four cups of flour. Mix it up. (I used a wooden spoon—acutally, I didn’t use modern kitchen technology at all in this recipe–unless you count the stove and oven.) Cover and let sit for an hour. 3. An hour later: Check your dough. Add 1/2 cup of flour, 1/2 tsp of baking powder, 1/2 tsp baking soda, 1 tsp salt. Mix it up. Either make rolls or let it sit in the fridge (we went for a walk so my dough sat). 4. If you wanna make rolls, sprinkle some flour on a nice flat surface ( a clean counter top would be good–if you can find one). Take half of your dough and roll it out into a long flat rectangle. Make sure it is nice and wide. 6. 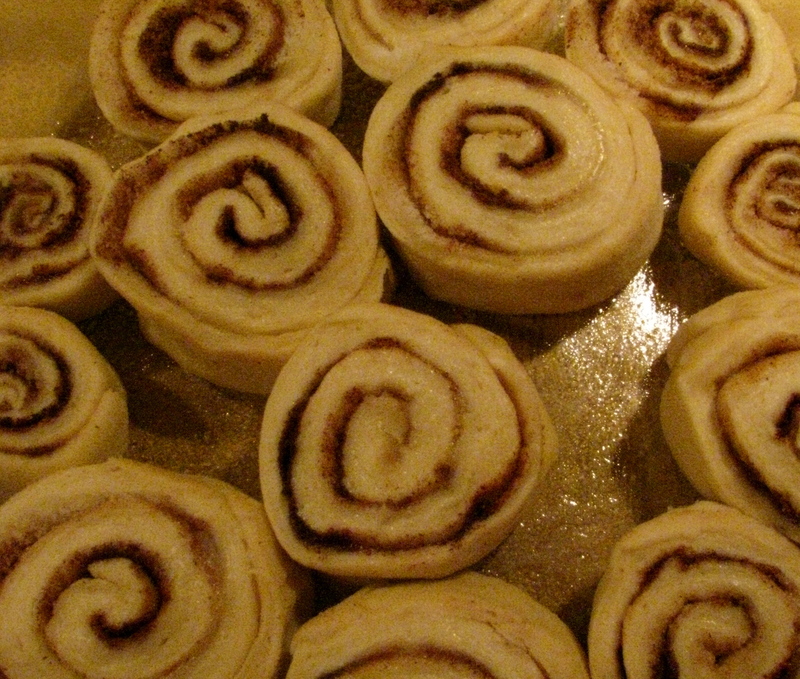 Grab the edge of dough fartherest from you and begin to roll. Roll it slowly until you get to the edge closest to you. Bring the edge closest to you to meet the rest of the roll. 7. Take the log and cut into slices about an inch wide–maybe a little bit more. Place each roll into the pan with some space for them to grow. They will grow. Let them sit for about 20 minutes before baking. I let mine sit overnight in the fridge before baking so that we could wake up to the yummy smells of fresh baked cinnamon rolls. It worked just fine–except the rolls grew a lot and got a little crowded. 8. While the rolls are baking, mix up some frosting. I used 3 cups of powdered sugar, 1/4 cup of milk, 2 T of melted butter, and 1 1/2 tsp of vanilla. Mix it up with a wooden spoon and drizzle (or dump) the frosting over the fresh-out-of-the over rolls. 9. Let sit for a few minutes and then dig in. You will be glad you did.